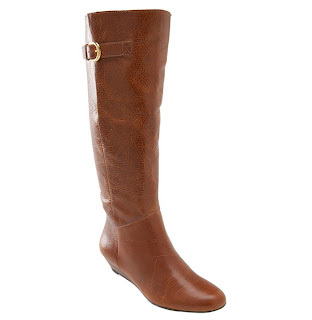 I swear it's because of the impending bad weather that I can't stop looking at boots. I took a break and tried these Aldo booties on and they're soooo cute! I don't even like Aldo but these booties don't look like some cheap knockoff.. Or do they and I'm just out of it? I liked the purple ones too. I'm keeping my eye on them. They're not expensive but why pay regular price. They're bound to go on sale and then I'll love them more! the bad: had a horribly consuming battle with my mother about wedding arrangements. the ugly: my face after several hours of crying. 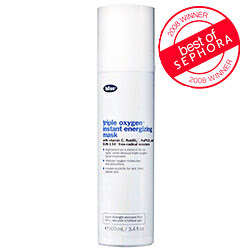 the good: used the Triple Oxygen Instant Energizing Mask by Bliss and actually saw my face brighten up and look normal! I normally give myself mini-facials at home but can never figure out how I get that glow because I use multiple products to exfoliate and hydrate. I was lazy last night and decided to only use the oxygen mask and voila! Fancy face! The next Project Runway contestant? Not so much. 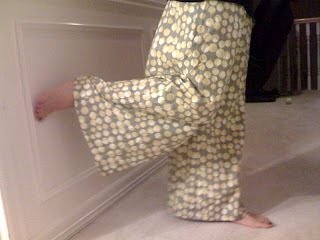 Then again, I didn't design these ginormous clown pants. I just followed the directions! So this is the final product of my sewing class. Needless to say, I will not be using the pattern for these again! Completely unflattering. I swear my legs don't look like tree stumps. That much. But it was definitely fun learing how to sew! I want a sewing machine for my bday (in 12 days!) Make it happen. Put 10 items in the Forever 21 shopping cart; I did not check out. Told my coworker that she looks like a watermelon because she's wearing pink pants and a bright green shirt. Checked my boss's calendar to see if it had any clues about when we're getting our bonus. Quit the gym I belong to now and find another one closer to home with a pool. Read the stack of magazines that just arrived in the mail. Catch up on Gossip Girl, The Hills, Rachael Zoe Project, Prison Break.. DVR! Make an appointment to go threading because it's starting to look more like eyebrow than eyebrows. I looooove new socks and underwear. When I was a teenager, my favorite kind were from Mervyn's and I would buy them everytime there was a special for 5 pairs for $10 or was it 10 pairs for $5? Nowadays I like Calvin Klein Naked. Sprinkling truffle salt over everything - popcorn, roast chicken, risotto, pasta... Yum. Going to the Puyallup Fair at the end of Summer: eating Young Life BBQ beef sandwiches, roasted corn, scones, baked potatoes, roasted corn, caramel apple towers, roasted corn, turkey legs; watching demonstrations on the latest home gadgets; looking at the cows while I'm eating one of the aforementioned beef sandwiches and shouting, "Say goodbye to your friends!" Getting massages and facials and pedicures.. Pamper me! I can put my fist in my mouth. The fish oil that I've been taking gives me lemon-flavored burps. My meatloaf consists of 2lbs of ground beef, 1 lb of ground veal, 1 lb of ground pork followed by 1 lb of bacon which is layered on top of the loaf. Don't you dare put ketchup on it! 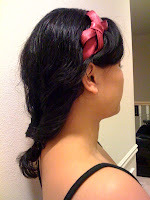 I was formally known as the 1st Princess in the Miss Seattle Chinatown Scholarship Pageant. Don't ask. And yes, they're icky Steven by Steve Maddens. But they're actually comfortable and I like the color and I like the fit and I like the wedge heel and I just plain like them. Oh and Nordstrom had triple points over the weekend. And I just returned a bunch of other stuff that I shouldn't have bought in the first place. Ok. I'm done trying to justify it. They didn't have them in my size so I'm having them sent to me. HURRY!!! LRB: I dreamt about spiders last night and kept waking up. HB: Oh really? What was I doing? LRB: Ugh. You don't exist in my dreams. HB: Right. It's because I'm not a dream any more. I'm your reality. You lucky girl. LRB: rolling eyes Can I puke now? Per usual, I've been obsessing over something. Lately, it's been handbands. Perhaps it has to do with the new season of Gossip Girl. That Blair always has one on and I'm addicted to her! Anyway, I'm wearing it today to make myself feel better because HB's in Austin for the weekend on a business trip. Boo. Of course as soon as I say I may have found the perfect winter coat, I go and find another one to adore that costs nearly twice as much.. I mean this Manoush coat from Anthropologie isn't crazy expensive, but still. It's just Murphy's Shopping Law that I always like the more expensive one. I suppose the Soia Kyo coat is more of an every day coat, whereas this one is a little dressier. I just love the ruffles. Besides, I've been totally in love with everything Manoush ever since Mango and I shopped at the boutique in Le Marais in Paris. I love the bracelet sleeves. And it's not too long. It's a good 4-5 inches above my knees. Anything longer and I wouldn't even consider it. What's a girl to do? It would be sooooo bad if I had both. At the very least, one of them should be black! 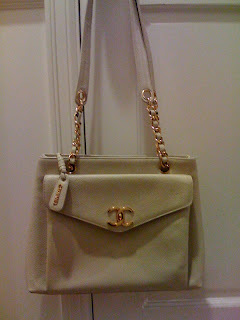 Okay, so this bag isn't really white. It's more of a cream color. Either way, I'm retiring it for the year. 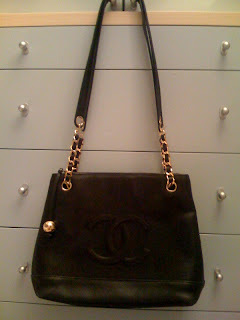 This is the second Chanel that my mom ever bought. Can you tell she really liked this shape? 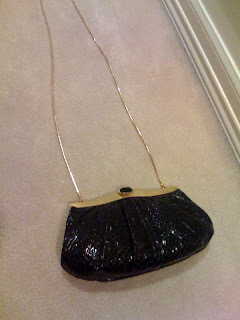 The hardware on the bag is on the verge of being an obnoxious gold but I think it just shows have fabulous the 80s were. I get so many compliments when I use it. I especially love wearing it when I'm really dressed down and throwing it across my chest messenger style. The straps aren't really long enough for me to do that but I keep it towards the back and out of my way. I love carrying fancy bags when I'm wearing sweats. The envelope pocket in the front is perfect for keeping my iphone and car keys easy to reach. There are three additional compartments at the top. One is full zipped and the other two are completely spacious. Don't you think that all bags should have tons of pockets? I hate bags that turn into the black hole because of the lack of compartments. I'm a big fan of using pouchettes and other means of organizing to keep everything separate. I can't tell you how many calls I've missed because I couldn't find my phone! 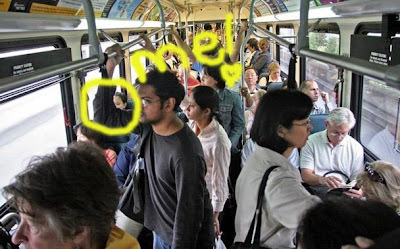 And have you had a wily tube of lipstick open in your bag and get everywhere? Not fun. I almost forgot! I was on the front page of The Seattle Times on Sunday! Yep! I made A1 above the fold! Sadly, fourteen of my cohorts were laid off yesterday. Sign of the times I suppose. It happened so suddenly. I wasn't able to say goodbye. Brutal. Swift. Done. I saw one girl rush out in tears, not knowing what had just transpired. But she was a crier. Cried at everything so I didn't know. And the guy I used to have lunch with? I spoke with him in the morning about our project. Then I didn't see him for the rest of the day. Then there was the meeting. Tightening our belts. Making necessary adjustments. It may not end here. Weathering the storm. We'll see. I think I found my coat. I'd just about given up on finding a new winter coat that fit all of my qualifications - to the point where I was even upped my price point to $400-500! 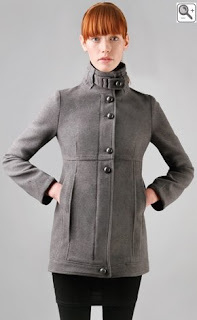 Luckily, I picked up a Soia Kyo coat at the Rack for under $200, similar to the one pictured. The buttons and the back are slightly different. I really like the collar and how it can be worn up with a strap to keep the cold out. One of the reasons I've been having such a hard time finding a coat is that I hate long coats. I like them to hit about mid-thigh - anything longer and I won't wear it! If it's too short though, then my tops stick out and while that's cute and stylish sometimes, it doesn't always work! Anyway, I have 30 days to find something better. According to mommy-dearest, she found it at Loehmann's in the 80s for $30 or so. Isn't that amazing? I think it was a pretty good investment on her part. Thank goodness I saved it from the Goodwill bag! Admittedly, the skin has gotten dry over time and is extremely delicate so I don't use it often. But when I do, people definitly stop me and ask where I got it from. To which I blithely reply, "It's vintage." 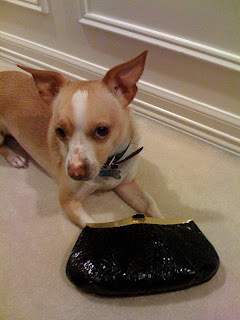 Jude also has this perfect-for-when-I'm-trashed-and-can't-keep-track-of-my-bag hidden strap. I can just throw it over my shoulder and ta-daaaaah! No worries about leaving it in the hands of some dishonest person. she got it from her mama.. I think I'm going through shopping withdrawals. I've been totally grumpy and I know it's because I haven't bought any clothes in a while. Yes, I did go to H&M and F21 over the weekend. And yes, I did have an armful of clothes. But no, I put everything back because I just wasn't that into it. Anyway, all this moping around got me started on digging around my closet for something old that I could pretend was new. Needless to say, I hate my outfit today. I don't even want to talk about what a mess I am today. Phooey. On the bright side, I got to looking through my piles of bags. My mommy used to be such a fashionista! These days she's all about sweater sets and capris but back in the day.. Look at this georgeous Chanel bag that I scavenged a while back. Can you believe that she was on the verge of just "getting rid" of it! The horror! I totally remember when she bought this bag too - I was probably in 5th or 6th grade. We went to the Chanel boutique so many times to look at it because she felt so guilty for finally being able to afford it. Daddy convinced her that she deserved it. 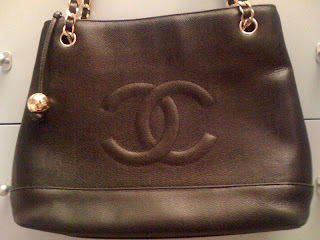 I've been thinking about sending the bag back to Chanel and having it refurbished. The gal in the boutique says it takes a few months but it's worth it. Hmmm.. Maybe.. Anyway, it's good being the only daughter because I pretty much cleared out mommy's closet in one swoop. I'll share more of the loot later. A crocodile clutch anyone? 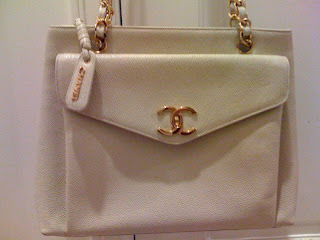 And more Chanel to come... Ooof. This post is dedicated to the crazy Chinese woman shopping at my parents' store who randomly told me that I'm pretty much the fattest thing she's ever seen and that she would never let either of her sons marry me. 2. If I knew you were the mother of the man that I am marrying, I would run away! 3. Don't try to bargain with my parents' while you're insulting their daughter.